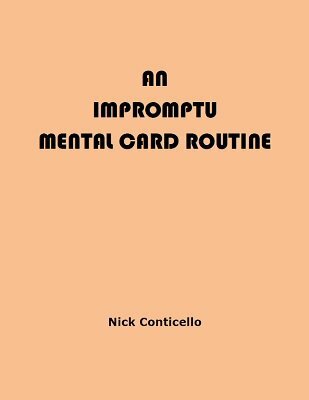 Tarbell Course contributor Nick Conticello follows his debut The Shadow Placement with three more sensational new effects requiring only an ordinary deck of 52 cards and a clear head to perform. One sleight is required; we include The Widdershins Cut, an effective and simple false cut. 1. THOUGHT CAUGHT: An unprepared deck is shuffled by the performer and cut by the spectator. Two piles of cards are dealt out. The spectator thinks of a card in one of the piles and buries the selection in the deck himself. The performer scans the cards quickly, and removes one card, which turns out to be the selection. No sleights, no outs, no guesswork. The spectator cuts the pack before and after the selection process! This effect introduces two new concepts: the Radar Principle and the Littlecount. 2. AP DIVINATION: The pack is shuffled by the spectator who removes a number of cards at random and counts to a mental selection. The performer finds the card without looking at any of the faces. This one features a new twist on a well-known idea. 3. THE POWER OF FAITH: The finale is perhaps the strongest Smith Myth type effect ever devised. The spectator freely thinks of two related cards with the pack in his own hands. He also shuffles the selection packets. (No counting is involved in the selection process.) The pack is cut in half so one chosen card is in each half. The thought-of cards somehow end up in the same position from the tops of their respective piles. This can be done with nothing more difficult than a false cut, but a handling with a false riffle shuffle will also be disclosed. 4. THE WIDDERSHINS CUT: A simple and effective four-way cut, reprinted from The Shadow Placement . Whether or not you like so-called "self-working" card tricks, you will not want to pass up a book which may herald a revolution in the technique of mathematical magic. 1st edition 2014, 19 pages. The first trick alone in the book is worth the asking price. It is finding a selected card that will seem impossible. I have never seen the method in print before. The second trick I have seen be used in other effects but basically you are performing this one to set up the deck for the third effect. The last one is very good also as two selected cards are found located in the same position in two separate halves. My favorite as you can tell was the first effect but overall definitely worth the purchase.